Expertise Areas: Licensing, Brand development, Market analysis, Media planning, PR strategy. For over 6 years Viktorija has worked for CWF SAS (Children Worldwide Fashion), the largest luxury, premium and casual childrenswear licensor and manufacturer globally. The brand’s portfolio currently includes Chloe, Little March Jacobs, BOSS, Karl Lagerfeld Kids, DKNY, Timberland, Zadig & Voltaire, Billieblush, Billybandit, Carrement Beau and Une Fille. 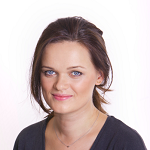 Viktorija Benaityte is a true communications guru, currently overseeing all of the PR and Communications activities at CWF SAS in the UK, Scandinavia, Benelux and DACH region. What is more she is advising SWF SAS on further expansion into Russia and Eastern Europe since mid 2016.